Castle® Steam Cleaning Compound™ was developed for the professional, to be used in a steam-cleaning unit. This highly concentrated product contains wetting agents for maximum penetration and lifting of stubborn dirt, grease, and grime. Special agents work to keep soils in suspension. Water softening agents prevent hard water deposits in steam cleaning equipment. 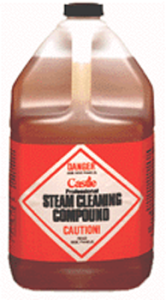 Steam Cleaning Compound can be diluted up to 80 parts water to 1 part compound. When added to steam generators or high-pressure washers, there is no cleaning job too tough. It leaves no residue, and can be used with hard or soft water. When used as directed, corrosion inhibitors protect soft metals such as aluminum. Protective wear should be used and directions followed. Steam Cleaning Compound is a very high pH formula. Maximum precaution should be used. 1. Mix Steam Cleaning Compound and water in either steam generator or high pressure washer. 2. Mix depends upon equipment used and depth of cleaning needed. 3. After reading precaution label, spray on and rinse thoroughly.